The photo of Sonia Gandhi in Goa has been widely shared, with some commenting on social media that for a change, it is she and not her son taking a holiday. Sonia Gandhi takes a break, days after handing over the reins of the Congress party. 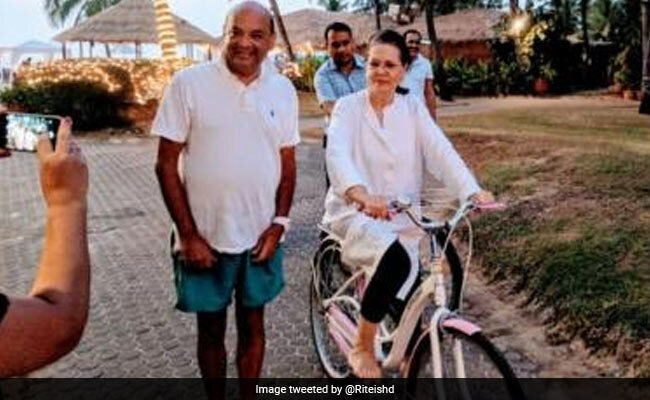 Sonia Gandhi, 71, was seen riding a bicycle and smiling for a photo in an image tweeted from Goa, where she went for a break just days after handing over the reins of the Congress party to son Rahul Gandhi. Sonia Gandhi reportedly left for Goa on December 26, the day after Christmas. The photo of Sonia Gandhi in Goa has been widely shared, with some commenting on social media that for a change, it is she and not her son taking a holiday. Her absence during the Congress's 133rd foundation day celebration today as Rahul Gandhi addressed the party, underscored her retirement. Sonia Gandhi led the Congress for 19 years. Some pictures make you happy... this is one of them. Rahul Gandhi, 47, took over as Congress chief on December 16 from his mother, who had retreated somewhat from active party work on account of her poor health. "He is my son, and it would not be suitable for me to praise him," said Sonia Gandhi, addressing the party for the last time as its chief. Right after becoming the new Congress boss, Rahul Gandhi was left to deal with two more state election defeats for the party - in Gujarat and Himachal Pradesh. He has held meetings to review the party's performance. Unlike last year, when he was criticized for taking a New Year holiday in the middle of opposition protests against demonetization, this year he is staying in town. Rahul Gandhi's vacations have been derided often by the ruling BJP, which said in the past that his long getaways reflected his disinterest in the party and politics. Reports say Sonia Gandhi usually stays in the hotel Leela in south Goa. She is likely to return in the first week of January.